Beacon comes with a handful of settings that let you control how your customers get in touch. You might want to use a Beacon with Docs only, just a contact form, or with chat and a contact form. In any case, these settings let you dial that stuff in. Contact form submissions send directly to the mailbox connected mailbox. If you disable this option, customers will only have access to Docs search. Hit the toggle switch to enable live chat in your Beacon. The option to chat will only show to customers when there are Users who are online and available to chat. 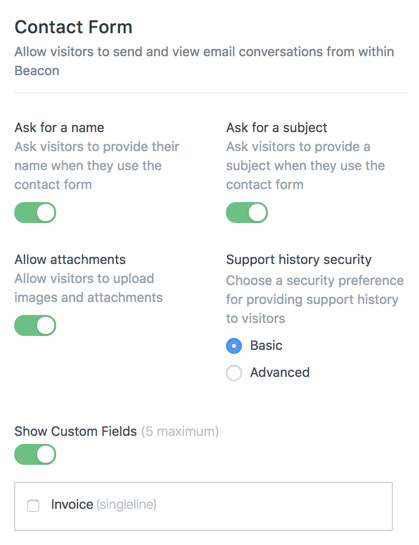 Ask visitors to provide their name when they use the Beacon contact form. If you’re using the identify method and customers have used your Beacon before, the name field is automatically hidden. Note: This field is required when enabled. The Support History feature allows a customer to see all of their previous conversations. This includes Beacon contact for messages, chat transcripts, as well as direct email history. Beacon uses the Basic security option out of the box, which limits history to the customer’s browser session and device. Basic: We use a device ID and a cookie to show support history to customers. Advanced: This requires a secure key to implement, and little work on your end, but includes your customer’s full support history on all devices. Ask customers to provide a subject when they use the Beacon contact form. If this option is disabled, we’ll take some of the message body and use that as the subject when the conversation is created in the mailbox. Allow customers to upload images or attach files when sending a message through the contact form. There is a maximum file size of 10mb for both images and attachments. Customers can attach up to 3 images or files per message. 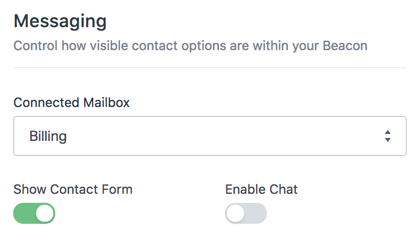 Customers on the Plus plan, or customers with the Custom Fields add-on, can show up to five custom fields on the Beacon contact form. We use the same field names you see when viewing a conversation in Help Scout. If you display custom fields to customers, we’d recommend using customer-friendly field names. Note: If a field is required in the mailbox, it is required on the Beacon contact form.